A series of blasts has shaken India's holiest Buddhist shrine, where the Buddha himself is said to have gained enlightenment, police have said. 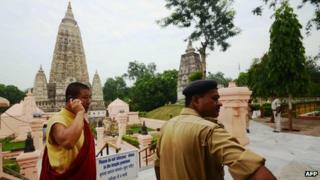 Two people were injured in nine explosions in the Bodh Gaya temple complex, in northern Bihar state. Prime Minister Manmohan Singh strongly condemned the blasts, saying: "Such attacks on religious places will be never be tolerated." The Bodh Gaya complex is one of the oldest Buddhist sites in India. It was listed as a world heritage site by the UN cultural organisation Unesco in 2002. Correspondents say attacks on Buddhists are rare in India, but there have been recent Muslim-Buddhist tensions in nearby Burma (also called Myanmar), Sri Lanka and Bangladesh. The Buddha, Siddhartha Gautama, went on a quest for enlightenment some time in the 5th or 6th Century BC. He is said to have achieved it while sitting under the Bodhi tree (tree of awakening). There are currently some 376 million followers of Buddhism worldwide.